Few words evoke a more chilling response than "human trafficking," yet slavery persists. But what is it really like to be sold? Zara knows. As a six-year-old, she was sold to a factory owner and put to work. Fifteen years later, she was sold again—this time to a brothel in Bombay. But it is one thing to be sold, and another to be owned. When Zara and her fellow prostitutes resort to blackmail to get justice, their cell phone—and the incriminating photos it contains—are taken by a police commissioner. 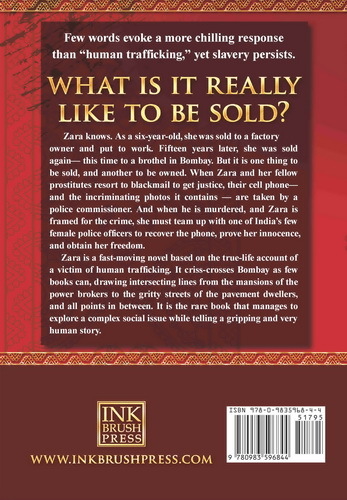 And when he is murdered, and Zara framed for the crime, she must team up with one of India's few female police officers to recover the phone, prove her innocence, and obtain her freedom. Melvin Sterne's Zara is a fast-moving novel based on the true-life account of a victim of human trafficking. It criss-crosses Bombay as few books can, drawing intersecting lines from the mansions of the power brokers to the gritty streets of the pavement dwellers, and all points in between. It is the rare book that manages to explore a complex social issue while telling a gripping and very human story.